Using the “richest 10%” as your benchmark is misleading. America features not just lots of ordinary income inequality, it features lots of income inequality at the very tippy top of the income distribution. The real scandal of our tax system is that the top 1% and the top 0.1% make wildly more money than the top 10%, but they pay effective taxes at about the same rate. This chart doesn’t capture that. 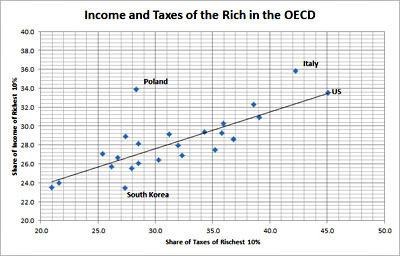 That said, it’s absolutely true that lots of other countries have only moderately progressive tax systems too. Most European countries raise far more in taxes than we do and fund a much greater range of social services, but they mostly do it with a combination of progressive income taxes, moderate taxes on capital, and fairly hefty VATs that are either regressive or flattish. Add it all up and the shape of their tax systems turns out to be fairly moderate. If you put all this together and then reconstructed the chart, I think you’d find that most European countries do, in fact, have a somewhat more progressive tax structure than the U.S. But not by a lot. Roughly speaking, the social contract in Europe requires everyone who’s non-poor to pay fairly heavy taxes, and then uses that money to fund broad social programs that are, themselves, quite progressive (a bus driver gets the same value from the French national healthcare system as a millionaire does). There is, it turns out, more than one way to skin the progressive cat, and you can do it on the spending side just as well as on the taxing side.